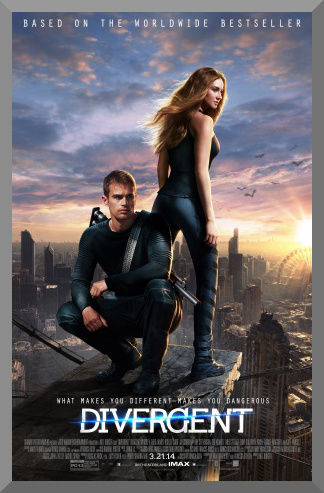 Divergent forgoes the simpler pleasures of movies like a reasonable runtime for its content and coherency during action scenes, and leaves us with a dull result – occasionally interesting and with enough talent but far from enough plusses to warrant a recommendation. This is definitely a case of a movie where the whole is far less than the sum of its parts. It’s the latest set of movie adaptations based on a bestselling young adult book series (this one is from the Divergent trilogy by Veronica Roth), and suffers from a lot of “First Movie Trip-Ups” – events that occur in the inaugural entry that show that everything is still trying to find the proper footing, although they (hopefully) are resolved later. Abnegation – The selfless folks that run the government. Amity – The optimistic farmers. Candor – The judges, keepers of honesty and truth. Dauntless – The intense and incredibly athletic soldiers. Erudite – The serious intellectuals, who want to overthrow the Abnegations. You are tested towards the end of your teenage years to see which sector you are suited for. While great importance is placed on the outcome, you’re free to choose differently when the time comes, although you won’t be able to switch when your final decision has been made. Take the case of Beatrice “Tris” (Shailene Woodley) and Caleb Prior (Ansel Elgort), brother and sister. Both of their parents are Abnegations. Caleb chooses Erudite without a second’s hesitation, but things aren’t so simple for Tris. Her test results were inconclusive. She belongs in more than one group, and these are known as Divergents. Everyone is afraid of the potential of those with multiple talents, so known Divergents are stigmatized and regulated to slums. Tris’ test administrator (Maggie Q), attempts to cover up the data so she does not meet this fate, and on the big day, Tris chooses to be a Dauntless, as they have always interested her. She is entered into the grueling training required, and from the beginning, it looks as if she might not make it. It will take the work of both her and a Dauntless leader that goes by the name of Four (Theo James) to ensure that she can pass the tests and not rouse suspicion of who she really is. Divergent’s basic setup is more or less like a clear-cut satire of the clique mentality – you must belong in a group, and you are defined largely (or even solely) by that group. It’s not as if we haven’t seen the mechanical and unquestioned sorting process in stories before, like the Sorting Hat in Harry Potter, but most haven’t used it as the end-all-be-all of the setup of both the universe in which it takes place and the story’s own narrative. To its credit, Divergent shows promise in how this will have a huge impact, beyond the inherent stupidity of classifying humans into groomed categories, and does spark some basic wonder towards the end over how this will play into future installments. The best things in Divergent happen towards the end, where the film abandons its ream of gloomy, gray training scenes for a cathartic, fast, and generally entertaining finale. However, since it takes over two hours to get there, I can’t say that it’s worth the wait. The script lumbers for 140 minutes, occasionally touching upon a well constructed action or story-developing scene, but all it consistently does is drag on and on, generating little interest for itself. Other problems include camera work and editing. Sometimes it frames big, sweeping shots beautifully and shows the slick production design, but during action scenes, and devolves into a mess of quick cuts and close ups. There are problems with character development, like a forced romance between Four and Tris, which seems to be birthed out of the concept that any professional pairing of a man and a woman must become personal – it doesn’t always need to exist (Maybe it makes more sense in the book or as the story goes on, I don’t know, but here, it was introduced haphazardly). However, whatever problems the movie has, none can be attributed to the actors. Shailene Woodley is solid, fierce, and likeable as Tris, Theo James provides a brooding but complex male co-star, Jai Courtney is suitably despicable as Eric, a soulless trainer and Four’s colleague, and Kate Winslet chews the scenery away as an Erudite leader bent on overthrowing the system and killing the Divergents. Divergent has good qualities and bad ones, and it makes the mistake of letting the bad ones rule over. The good bits, like the acting and visual design, are lost under terrible pacing problems, poorly defined character development, bad editing/cinematography, and general dullness. A star rating is based on how much I would recommend a movie to other people, and despite the positives on display in Neil Burger’s film, they were massively overweighed in my eyes by the negatives that kept cropping up.